The stone circles listed below are ‘free standing’ examples which tend to be well-spaced and surround a flat area. Unlike many other regions there are virtually no associated ditches, banks, mounds or pillars which places them in a separate group all together. It is also possible that some of the earlier circles were made from timber in which case very little trace will be left of their existence. The largest cluster of circles is to be found on the north-eastern edge of the high moor where they form a distinct curved pattern known as the ‘Sacred Crescent‘. These almost appear to have been deliberately planned with intervals 1.25 to 2.0 km between each site. They certainly are located at a much higher altitude than the other circles where in some cases there is a 100m variance. Butler, (1997, p.146) suggests that certainly in the case of Buttern Hill, Scorhill, Shoveldon, Down Tor, and possibly Fernworthy and Brisworthy the circles appear to be defining the limits of field systems. It is this proximity to the boundaries of field systems and how the actual field boundaries themselves appear to purposefully avoid the circles that could give an indication of their usage. It almost seems that the circles were placed on ‘common’ ground in order to permit a wider access to include a wider community than just the nearby settlements. In other words, the stone circles acted as a meeting place and were located at a mutually agreed ‘no man’s land’ which lay between the well defined boundary systems. The actual physical location of the sites suggests that the builders were looking for almost level ground, most of the circles range from perfectly flat to a 4º slope. Apart from Mardon Down and Langstone Moor the rest of the circles are situated where they can be overlooked from higher ground and often visibility is limited to one direction by means of a ‘fold’ in the hillside. This possibly could have been the direction of approach which would give some sort of processional route to the circle. In addition it also seems that the actual direction of the slope was of little consequence to the builders as there is a large degree of variance which ranges around all points of the compass. The million dollar question is what were they doing at the circles? Seven of the circles had been excavated in the late 1800’s, early 1900’s, by the Dartmoor Excavation Committee. This work revealed mostly charcoal with a possible cooking stone at Langstone Moor and a flint at Brisworthy. There has as yet been no evidence of human burial at any of the circles which along with the vast amounts of charcoal may indicate some feasting or ritual connection. One consistency that Burl, (2000 pp.152-3) seems to have found is that at the entrance to many circles are a flat-topped pillar on one side and a pointed one on the other. There also is a similar occurrence in stone rows where lines of taller stones stand opposite to shorter ones ,both phenomenon could indicate some kind of sexual symbolisation. This could mean that the actual stones were acting as some kind of signpost indicating that the males approached and entered the circle on one side and the females on the other. If this was the case then it would be safe to assume that both men and women took part in the rites and rituals held at the circles. It is interesting to note that apart from the Grey Wethers and possibly Scorhill Circle there are no legends or alternative names attached to the circles. Whereas the smaller, retaining stone circles that are associated with burials nearly all have a legend of some kind or an alternative name. For example; Grims Grave, the Nine Maidens, the Dancers, the Pipers, the Money Pit, the Ringastan etc etc. All of these have similar stories of humans being turned to stone, usually for breaking the Sabbath. Could the very fact that all these places are burial sites and therefore further back up the theory that no burials took place at stone circles? Butler, J. 1997 Dartmoor Atlas of Antiquities – Vol. V, Devon Books, Exeter. (pp. 145 – 154). My wife and I along with two other couples will be traveling the countryside in Devon and Cornwall this October. We are extremely interested in the stone circles, their history and find them very moving. We both have English, Irish, and Scottish blood and feel drawn to experience them. The other two couples have never seen any nor appreciated their magnificence. We are not familiar with any locations, but understand there may be some where we are driving that we could possibly view. Although we will see Stonehenge, that has become too “touristy” and commercialized and we would prefer to experience stone circles that are accessible and can truly be appreciated. We are taking the A30 from Exeter to Tintagel and later we will spend a day around Buckland in the Moor. With your experience, are there any along or near our route that are accessible to common people? Or can you direct us to a site where we could obtain this information? Thanks you so much for your consideration. 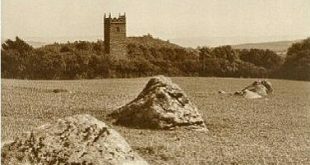 Hi, If you are driving down the A30, probably the nearest stone circle is the Nine Maidens which is about a 1.5km walk from Belstone. see this link – http://www.legendarydartmoor.co.uk/nine_maidens.htm. If you would like directions please email at dartmoorlander@aol.com.